In a saucepan over medium-low heat, brown breadcrumbs with butter until golden, about 8 minutes. Once cooled, combine with tomatoes, parsley, garlic, Romano and salt in a large bowl. Mix with beaten egg and milk to incorporate. Add ground turkey to the mixture and combine by hand. 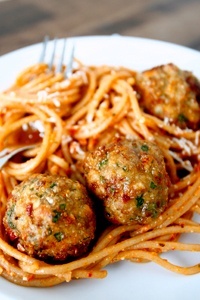 Form into medium-sized balls and arrange on a large baking sheet. Bake for about 25-28 minutes, or until cooked through. Be sure to turn halfway through cook time. Remove from heat and serve with your favorite sauce.